Another good day for an improving Manchester United. This was their seventh successive win and further evidence that they can win when they don’t play particularly well. This was, though, a dreadful day for referee Mike Dean. 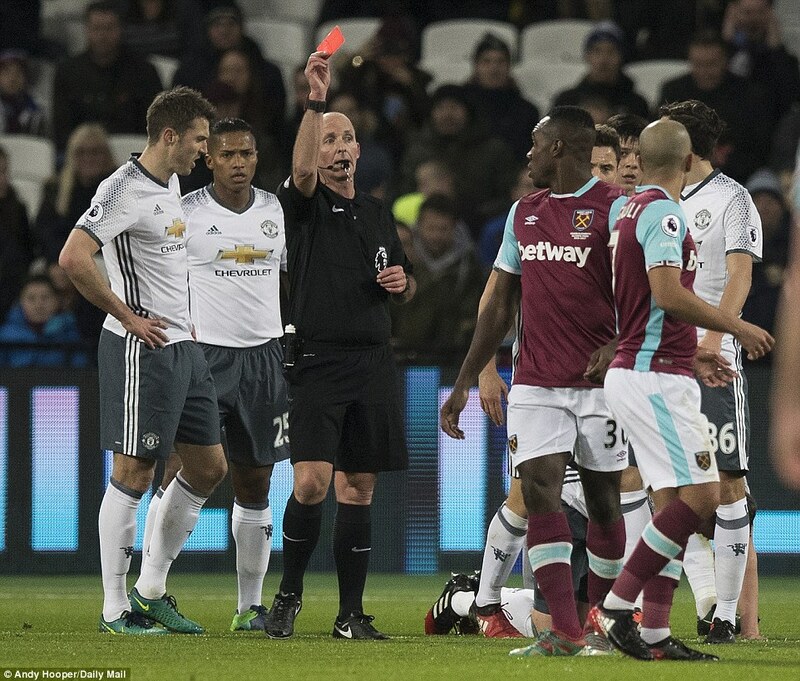 The match official was the difference between the two teams on a day of baffling inconsistency at the London Stadium. 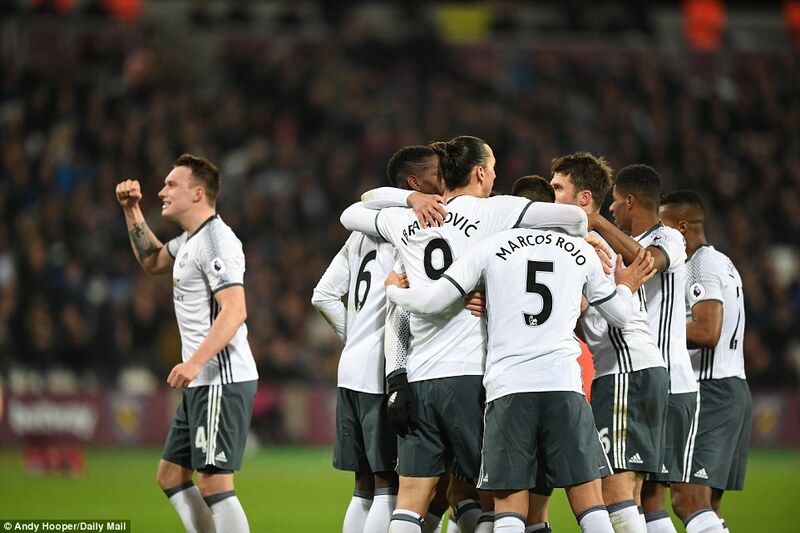 The bare facts are that United won through second-half goals from Juan Mata and Zlatan Ibrahimovic. Both were expertly taken on a day when Jose Mourinho’s team often found fluency and incisive play out of reach. 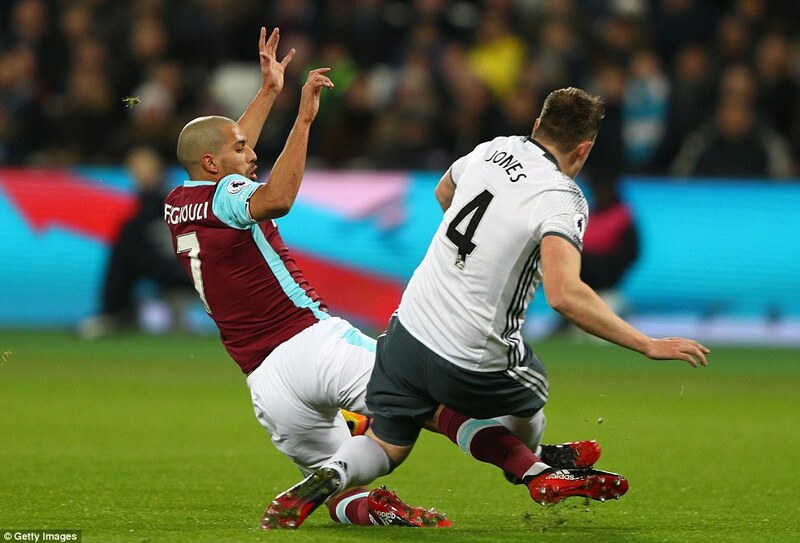 West Ham, though, played with 10 men from the 15th minute onwards following the dismissal of Sofiane Feghouli for a challenge on United defender Phil Jones. The tackle by the Algerian was certainly a little desperate as he tried to reach a ball he had miscontrolled. But the 27-year-old’s studs were down. It was not particularly dangerous and, as such, it was a yellow card at worst. That Dean chose to send the West Ham player off was quite staggering, particularly given that he subsequently allowed two worse challenges by home players to go unpunished. Referees make mistakes, of course. They make them honestly, too. Until the day that video technology is introduced for absolutely everything, they always will. This was a bad one, though, and it set the course of the game. From that point on, United were always going to win. Mourinho’s team took their time about it. 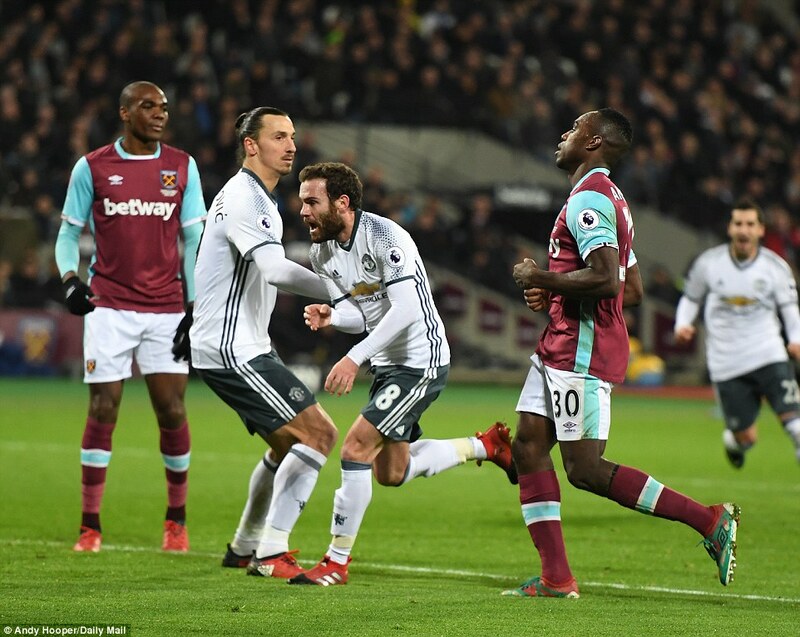 Mata didn’t score until the 63rd minute and this two minutes after West Ham’s Michail Antonio had spurned a glorious chance at the other end. Had Antonio scored, this could have been quite a story. As it was, there was time for another howler from the officials and, as a result, another United goal. 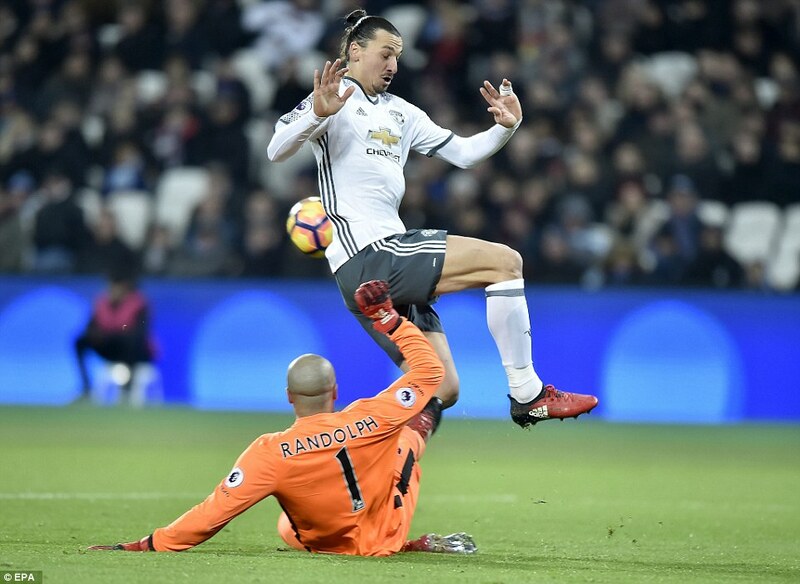 This time it was the linesman on the near side who failed to notice three United players standing in offside positions as Ibrahimovic – who was one of them – beat West Ham goalkeeper Darren Randolph from 16 yards. So another galling day for West Ham and another day to provoke debate about the standard of refereeing in this country. Dean is one of the better ones. It is usually his behaviour – his posturing – that irritates players and supporters. This time, his flaws were rather more fundamental even than that and prior to the sending off, there had not been much in the game. Football at this time of year – the sheer volume of it – can level things out between teams as players began to wilt a little under the workload. Before kick-off there had been some pessimism among some West Ham fans but there was little to justify that. Indeed the football was a little cagey with David de Gea the only goalkeeper to be called upon early on. The Spaniard’s save to turn aside a 20 yard shot from Manuel Lanzini looked spectacular but it was very much a safety first affair. The ball would have missed the goalkeeper’s left hand post by at least a foot. Beyond that, there was little to captivate but red cards change everything and that was very much the case here. There were no replays shown at the London Stadium but in the modern age supporters can access footage on their mobile phones and it was not long before howls of derision swirled around the stadium. A man down, West Ham had to reorganise but did so in terms of their approach rather than personnel. Bilic was incensed on the touchline but didn’t make any changes and for a while his team managed to hold their opponents at arm’s length. United were certainly a little sluggish early on. Their best player in the first half was the Armenian midfielder Henrikh Mkhitaryan, his passing by far the most incisive of anybody in white. Indeed it was Mkhitaryan who supplied United with their best chance of the half in the 36th minute. 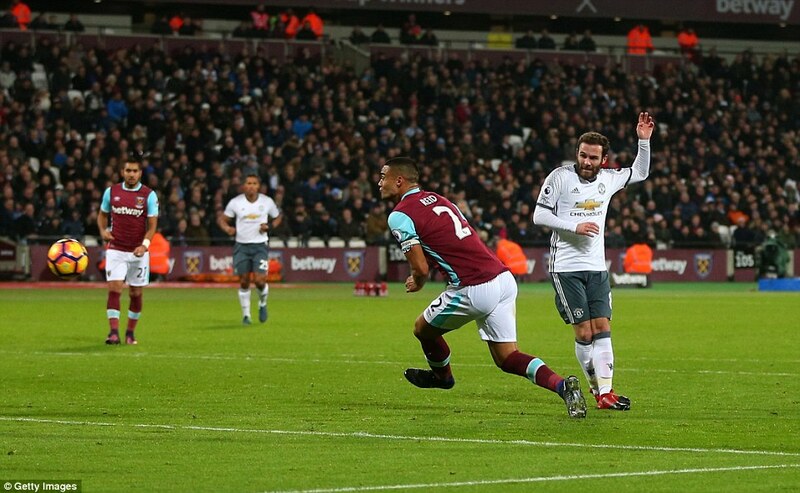 His pass across goal found Antonio Valencia unmarked inside the six-yard box. 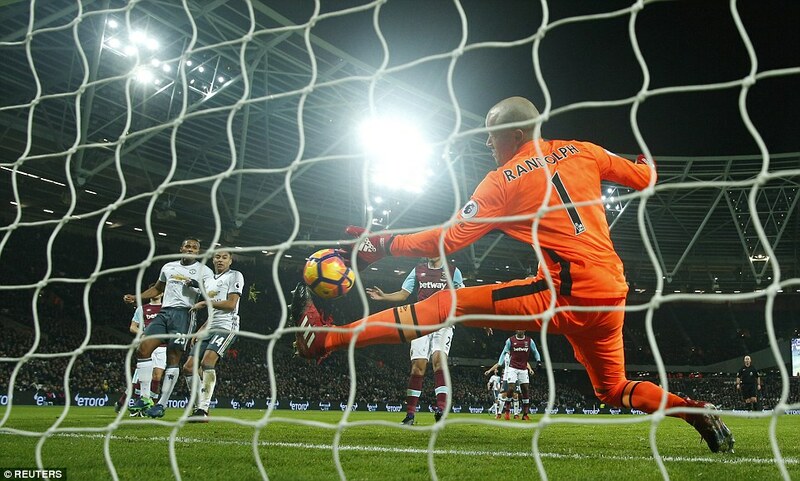 The United player’s shot should have given Darren Randolph in the West Ham goal no chance but it was directed straight at him and he was able to save. It was a poor miss but what followed was inexplicable. 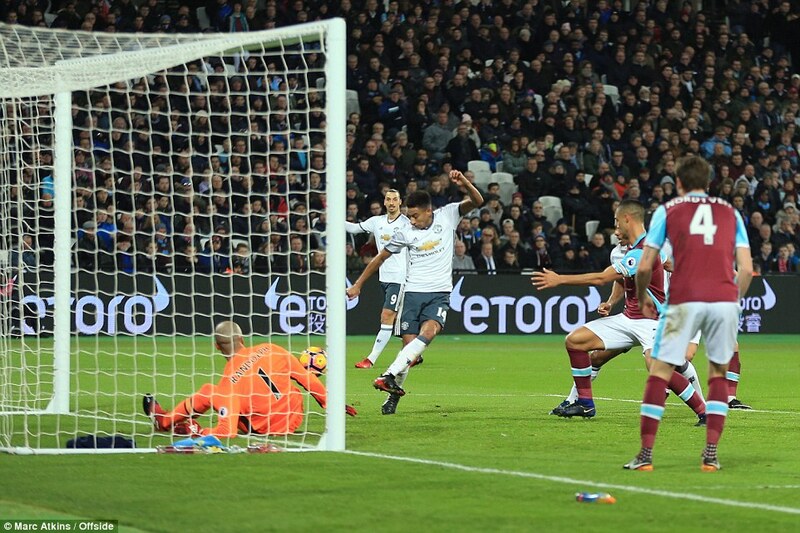 Jesse Lingard was even closer to the goal when the rebound arrived at his feet but he could only return it against the post and watch as it rolled along the line in to Randolph’s arms. Somehow, West Ham were still level. From then until half-time, there was little more on show than further examples of Dean’s strange refereeing. He chose not to even caution Havard Nordveit for ploughing through Mkhitaryan and then booked Matteo Darmian for what seemed a relatively innocuous block on Antonio. Subsequently Mkhitarytan played a lovely ball through to Zlatan Ibrahimovic only for the Swede to volley wildly over. 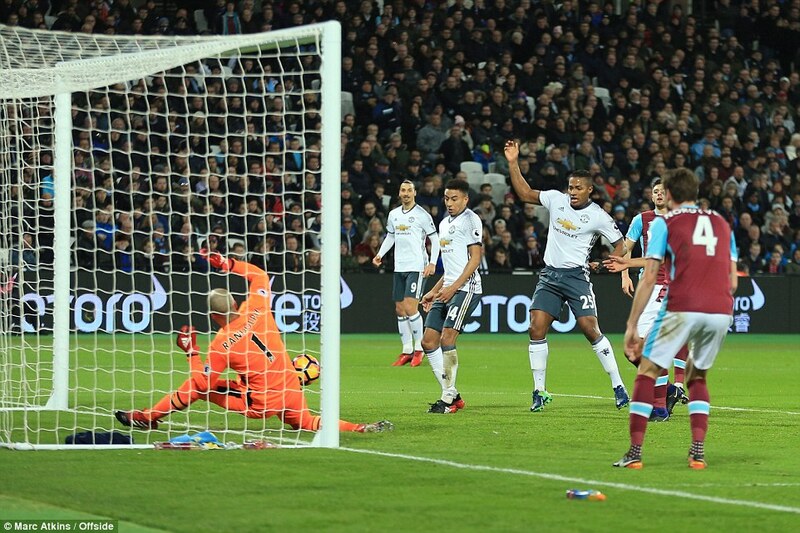 Then, in the last minute of the first half, Lanzini brought a super save from De Gea with a shot destined for the top corner. At half-time, Mourinho will have been less than satisfied with his team’s efforts. 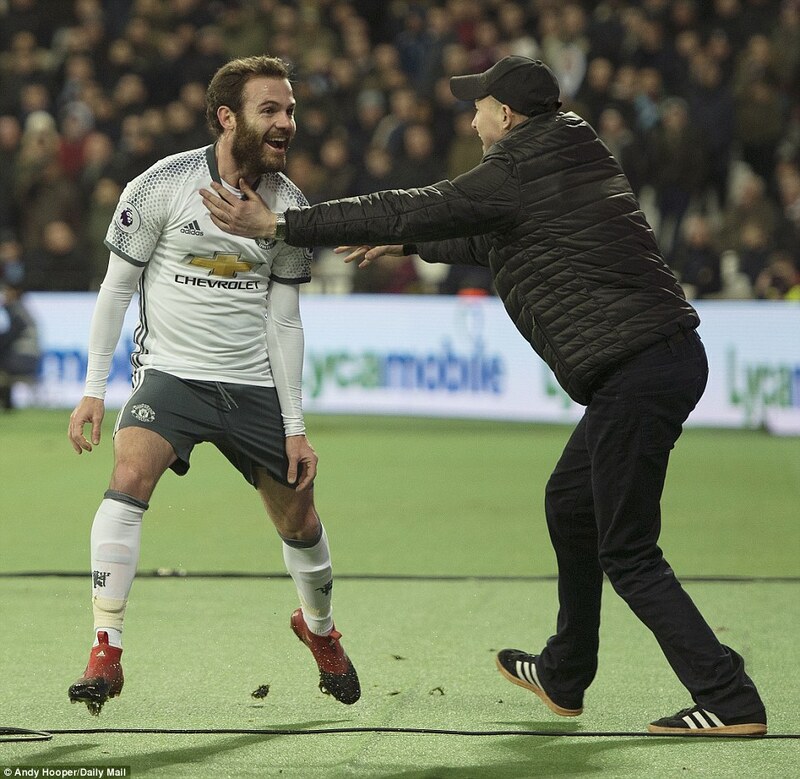 There had been little zip to what they did and that probably explained a change he made for the second period as Juan Mata replaced Darmian, Michael Carrick dropping to centre half and Marcos Rojo moving across to the left back position. For a while little changed and the only talking point was another refereeing decision. 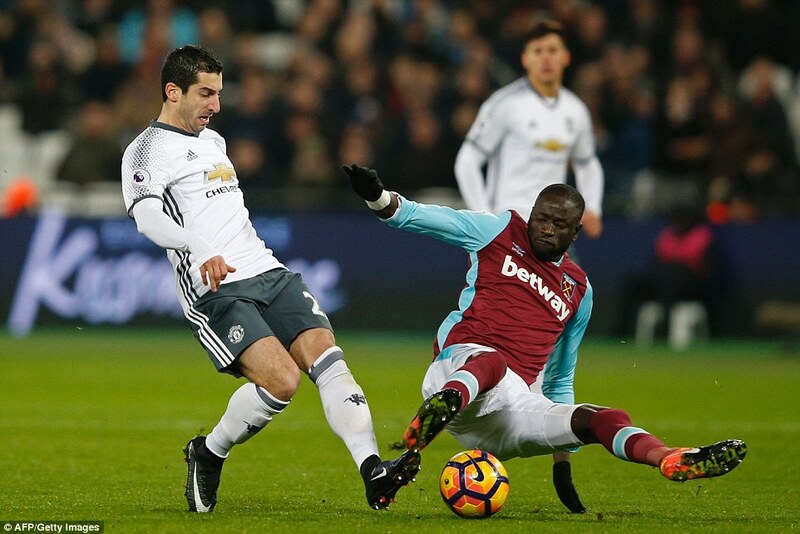 This time the West Ham player involved was Cheikhou Kouyate whose two footed lunge at Mkhitaryan in the 51st minute was by some distance the worst challenge of the game. Red Card? Yellow card? As it happened, there was no card. At the other end Antonio leaped to head a free-kick wide but worse was to come for the young forward. 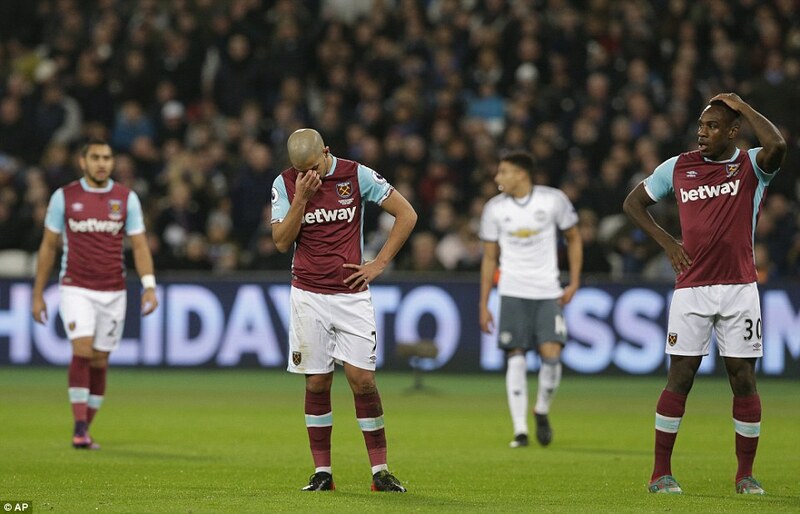 Just after the hour, Lanzini broke quickly on to United’s back four and briefly danger beckoned. The ball through the United back four was perfect and Antonio was on to it. It always needs a good finish to beat De Gea, though, and this wasn’t it. 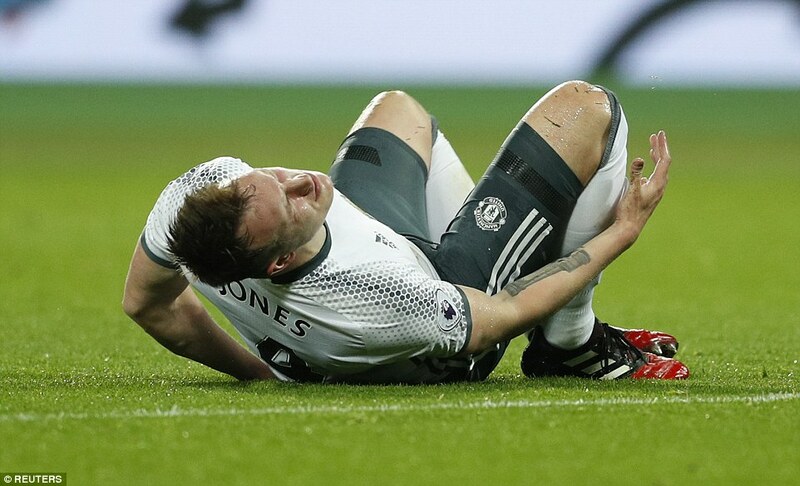 The save – with the goalkeeper’s left knee – was a good one but he shouldn’t have been given a chance and within two minutes West Ham paid a heavy price. 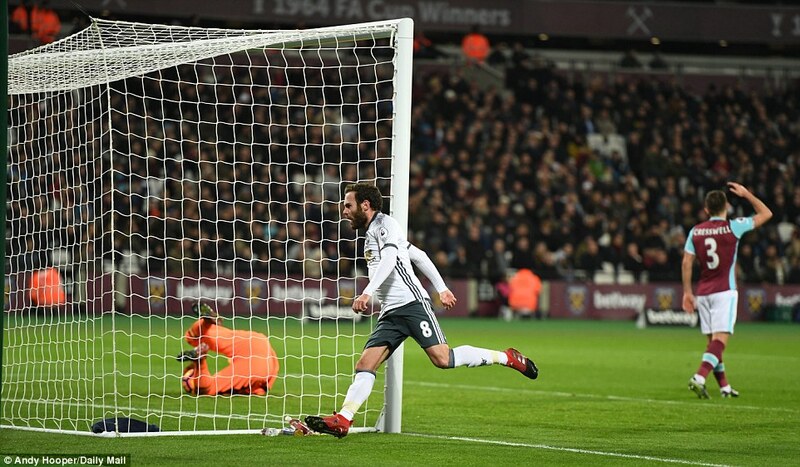 With youngster Rashford now on the field and operating down the left, he ran at Nordveit powerfully in the 63rd minute and when he pulled the ball back Mata arrived to smash it in to the net. 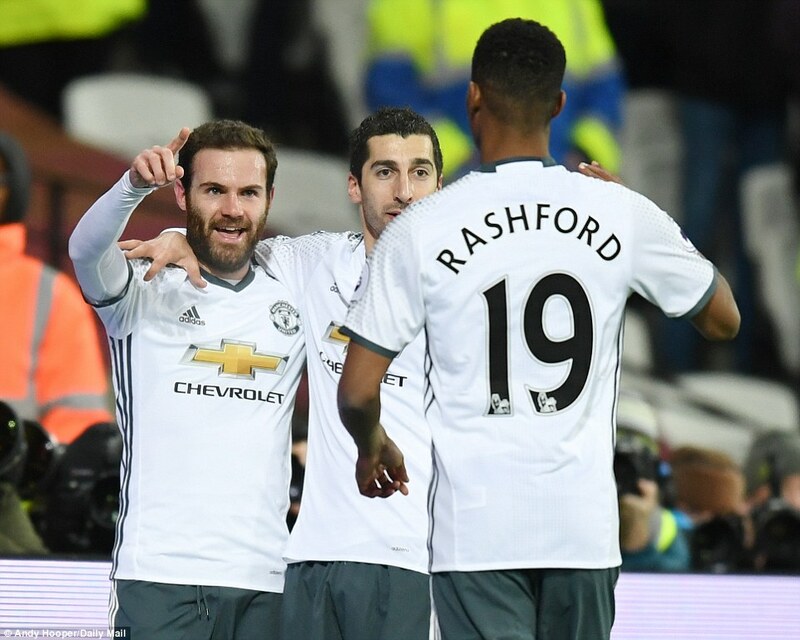 Rashford’s work was terrific and it was hard to blame Nordveit. 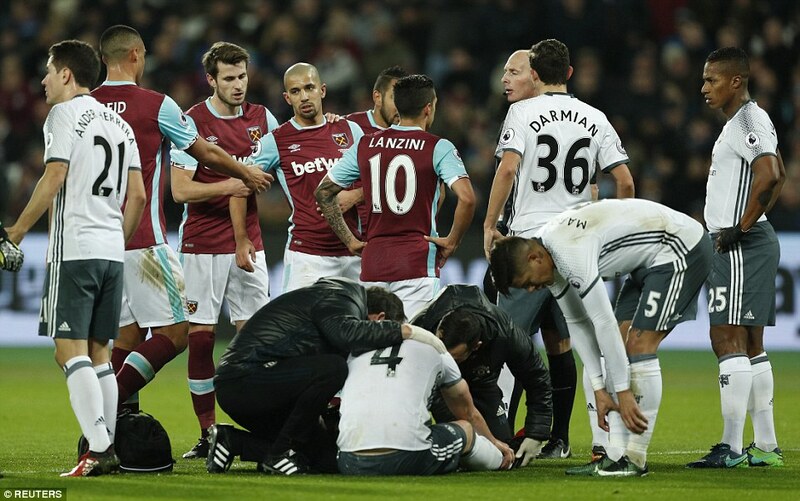 But the two West Ham players caught ambling back – Antonio and Kouyate – were culpable. When you are playing with 10 men, you can’t do that. One of them should have been within tackling range of Mata but neither were and the home team were suddenly looking up at a very tall mountain. 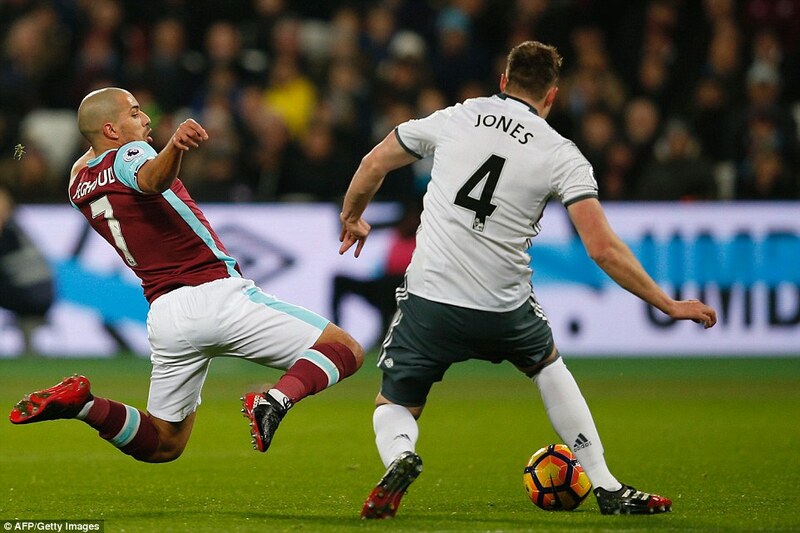 Andy Carroll soon replaced Dimitri Payet as West Ham had no choice but to chase the game. They were not short of effort, either, and occasionally broke with purpose. 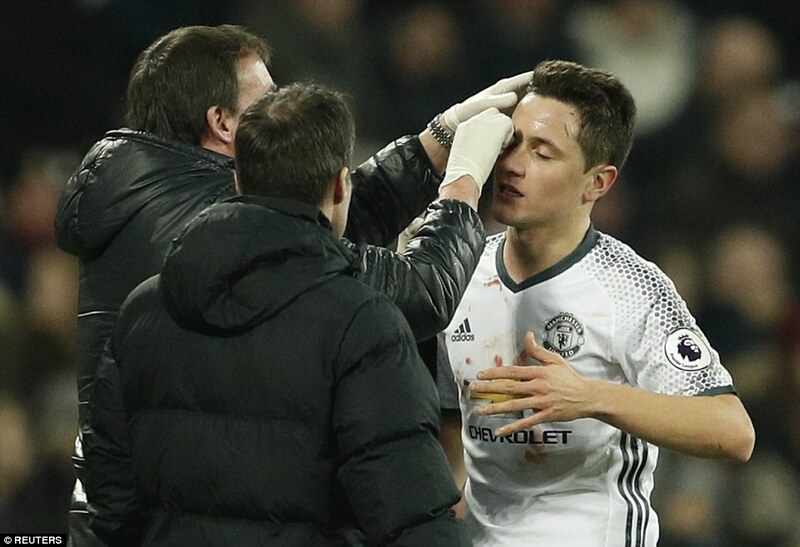 This did leave them exposed at the back, though, and it was a surprise that Paul Pogba couldn’t put the game to bed in the 74th minute. Once again Rashford did the work but when he laid the ball back to his team-mate, Pogba shot wide. It was a bad miss but it never felt as though it would matter and five minutes later Ibrahimovic scored to essentially the game. West Ham didn’t help themselves here. Pedro Obiang made a right mess of attempting to clear the ball on the edge of the area. But when Ander Herrera poked the ball forwards, three United players were offside, including the goalscorer.